Free cheerleading uniforms are not easy to come by. Cheerleaders who cannot afford the season's wardrobe will find themselves exploring a host of options, some of which boast grim success levels. There are a few methods for investigating the possibility of obtaining cheerleading uniforms for free, but the most hopeful prospects will involve a lot hard work and planning. Cheerleading is not an inexpensive sport. In fact, the better the squad, the more expensive the cheer season will likely be. The best squads often attend cheer camps and are involved in cheerleading competitions as well as their school football and basketball seasons. The more activities and events a cheerleading squad is invested in, the more requirements there are for uniforms and practice apparel. Many squads invest in matching practice apparel alongside the classic game and competition uniforms. Understandably, a competition uniform already poses a hefty expense. Shoes, socks, shell tops, skirts, hair accessories and much more can tally up the high cost of cheerleading. Not to mention that many uniforms need to be modified with sweaters or bodysuits in order to accommodate cooler weather and night games. These expenses can make cheerleading unaffordable for many households. So how can cheerleaders keep up with the financial demands? Free cheerleading uniforms are an unlikely scenario. Some cheerleading apparel companies will hold contests, awarding winners with a free uniform. However, banking your uniform on the chances of winning a contest is a very poor idea. An alternative means of procuring a free uniform is to consult a cheerleading graduate who no longer needs her uniform. This is often a weak idea for many reasons. The initial problem is that cheerleading uniforms are typically custom-fitted, and so you would need to find a graduate who is very close to your size, or at least was close to your size during her first years as a cheerleader. It is unlikely that the most recent uniform worn by a graduating high school senior will fit a freshman squad member. Moreover, cheerleading uniforms may change from year to year, or they may be personalized for each cheerleader. Also, many cheerleaders prefer to hang on to their uniforms for the sake of posterity, so it can be a battle to wrestle the sentiment out of a college-bound senior. A third method of obtaining a cheerleading uniform is to engage in a moderate amount of fundraising. This fundraising can be done as a squad effort through all sorts of means such as bake sales and car washes. The bake sale option will require an initial amount of capital as it still costs money to produce baked items. Another fund raising option is not that far off from traditional begging. Calling family friends and asking about the need for odd jobs, etc., is a fair means of achieving your uniform dream. Sometimes such requests will be met with sympathy and you may find yourself at the end of a sizable donation. However, should these loved ones remain pitiless to your plight, you will need to clear up your schedule for a summer's worth of lawn mowing and dog walking. Your school principal is rumored to be busy; however, it is the job of a school's leader to hear the desperate cries of students and staff alike. Perhaps your school does not recognize the burdens that cheerleaders carry on a regular basis. Cheerleaders are distributors of hope and morale, and on their worst day, they are the pallbearers of defeat. 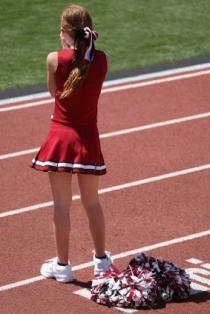 Thus, a school must support their cheerleading team to the same degree that cheerleaders assist their school's spirit. Writing up a lengthy petition for a uniform fund may yield fair results, provided that one member of your squad is a skilled debater. If such genius is lacking in the ranks, then it may be time to befriend someone in your school's law club; someone who can pen a provocative pamphlet that may, in turn, harvest fiscal support. Lastly, seeking out a sponsor or sponsors for your squad is a wise idea. Make use of any possible business connections that may lie within your squad or friends, such as corporate moms and dads. These individuals can help you locate stable companies that are quietly harboring altruism. Learning to write a professional sponsorship letter will also help to move things along. Such letters can be sent out to all sorts of neighboring businesses. Faster responses will come from smaller business, but the steady cash flow will arise from targeting larger and more successful companies. Sponsorship is a step up the pride ladder from begging and it's also infinitely less personal than prodding your dean for school funds that may not even exist in the first place. Procuring a free cheerleading uniform may be just about impossible except for the lucky few squads that are able to find really good sponsors. However, with a little hard work and investigation you can greatly reduce the cost of the uniforms for your squad.